Someone kindly commented on my article about gas detection brassards. There I mention that gas was also detected by pathfinders by applying paint to helmets and jump jacket sleeves. 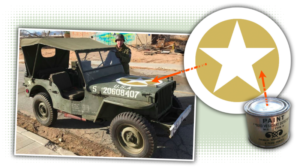 Apparently US WW2 vehicles were also painted with this stuff. The area between the circle and the star on the hood would be filled with it. I had noticed this on some vehicles, but didn’t know what this different shade of green was for.